Any other cars in the family? Alan drives what he describes as his ‘old Dodge Caliber’ just to get around of course. and Candace is replacing her Honda Civic with the new Evoque. Alan then added: “Oh and we own a ‘63 E-Type Jaguar” Wow, and it is a stunning example, once owned by singer, Wayne Newton. Not new to Jaguar (obviously) but this will be the first Land Rover. Cadace jumped in to say “and It won’t be our last!”. How did you come to your decision to purchase a Land Rover? What is your favourite thing about your new car? Colour? Capability? Looks? Candace loves the look of the car and is particularly fond of the Black Pack and the black 20” wheels. Alan likes the safety features. Where will you drive to first/ your first adventure? 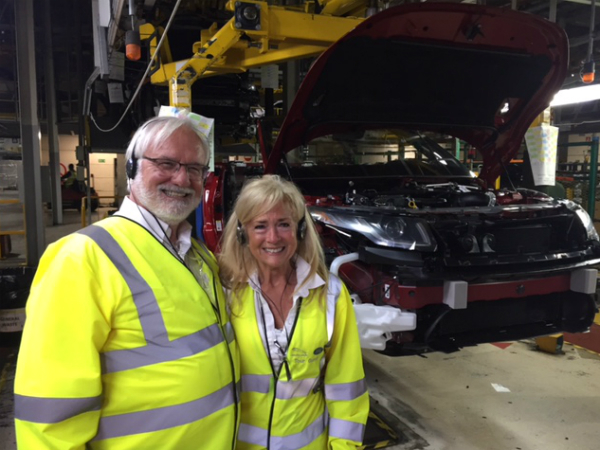 Alan and Candace flew all the way from the US specifically to see the factory (and their car.) Candace was able to fit (with a little help from our Trim Associate) the black-pack grille to their car. The pair had changed their minds on the colour of the car at the last minute so Alan had the order altered from white to red. However, Candace didn’t know the amend was made in time and was in tears at Halewood when she saw her new red convertible.